As I started this book I was reminded of Margaret Atwood’s Alias Grace (similarly centred around a patient and therapist). Although I read that book a long time ago, I recently watched the adaptation on Netflix, so I was a tad nervous one of our lead characters here, Theo, didn’t suffer a similar fate to Grace Marks’ therapist in Atwood’s book. This was a bit of a slow burn for me. It felt predictable and quite obvious. Until it wasn’t. Theo’s obsession with ‘treating’ Alicia seems quite inappropriate and as someone who’s worked tangentially in mental health I found it a tad unrealistic that no one tried to rein-in his obsession or call him on it. He basically goes out of his way to request he work with Alicia on his first day in the new job and given her notoriety (and the fact she’d been silent for six years and there was no urgency), I was surprised that: 1. warning bells didn’t go off for his boss; and 2. Theo didn’t even try to hide his obsession. It’s interesting that when he is (kinda) called out on it, it’s more about his desire to ‘save’ Alicia or be the one to succeed where others have failed than anything else. Having said that, I note that Michaelides studied psychotherapy and has worked in a secure psych unit and think that’s pretty obvious as he’s comfortable with the environment and / or surrounds and familiar and at ease with clinical methods and terminology as that all felt very believable. I was interested in Alicia’s backstory (though we don’t get to really know or engage with her to the extent I would have liked); as well as Theo’s own story. He tells us up-front he’s had a troubled history but years of therapy (with a psychologist he trusted and respected) offered him the treatment he needed. He’s very self-aware, as I guess we’d expect from a psychologist, and which I liked as IF Michaelides had given us a therapist in denial, it’d be annoying. Instead Theo often contemplates his own behaviour and thinking. And we’re privy to that as we’re in his head throughout. He’s surprisingly immature or naive in some ways (despite his post-therapy evolution) and there’s a sense his relationship with his wife isn’t entirely healthy. I was (at least) relieved he seems devoted to her which made the likelihood of him falling in love with Alicia less obvious. The story takes place in the present, but we’re also taken back in time via Alicia’s diary and interviews Theo conducts with those who knew her before the murder. And then of course, Theo shares snippets from his own childhood. For me it’s the last third of so of this book which is its strength as there’s a twist I didn’t see coming. We kinda know Theo is playing detective more than therapist and he’s accused of it a few times. He crosses a lot of boundaries in trying to learn more about the woman he’s treating and his obsession seems far from objective or healthy. I knew something was coming and suspected a tangent reminiscent of Leonardo DiCaprio in Shutter Island… where we’d learn via some diabolical twist that – in fact – it was Theo who was the patient! #spoiler – that’s not the case. As it happens I’d considered the actual twist (and some variations) but not in the way Michaelides offers it. It’s very clever and I was tempted to go back and read over stuff knowing what I later knew… to see if I’d missed obvious signs or if Michaelides slips up at all. * I understand the film rights have already been snapped up and I know Michaelides has a history in writing for the screen so think this would adapt brilliantly. 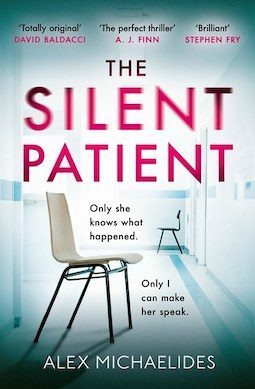 The Silent Patient by Alex Michaelides by Hachette and out in late January / early February 2019.